Pamplona is famous for San Fermín, but the rest of the time this ancient city is almost unknown to outsiders. Mark Eveleigh travels to the Kingdom of Navarre to discover Spain’s best-kept secret. Swooping out of the lush green hills of Spain’s north coast into the wide valley around Pamplona, I’m struck with the feeling that this is the spot where sun-blessed Spain first conquers the drizzly north. It’s difficult to imagine that just 40 minutes to the south there’s a landscape of shimmering desert plains and wind-sculpted natural monuments. That’s Navarre for you. This tiny province would fit into Tasmania six times, yet it’s among the most diverse regions in the country. Few visitors, however, ever see beyond the tangle of alleyways that is the setting for the world’s greatest fiesta. By ancient royal decree this desert region – known as Bardenas Reales National Park, or the Badlands – is governed by the seven villages within its boundaries. One of only a handful of deserts in Europe, it’s so remote that the US Air Force has paid to use the area for target practice in fighter jet training. 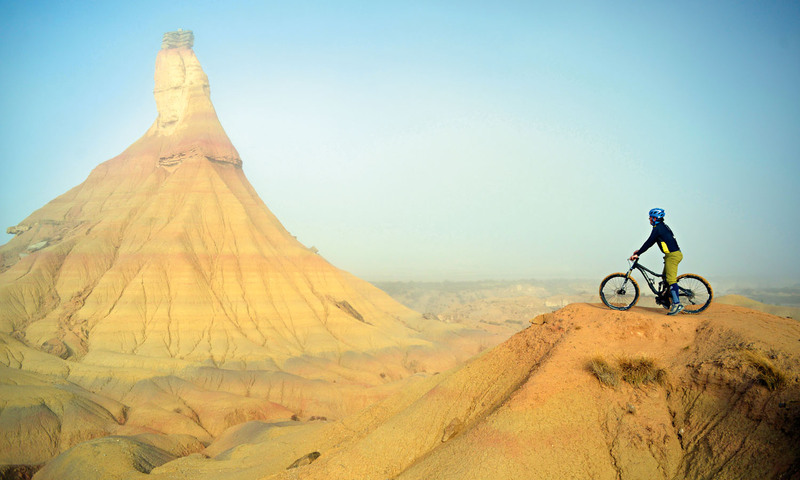 Millions of years of erosion have created an alien landscape in Navarre’s striking Bardenas Reales. But there are no fighter jets to slice the dawn haze as we unload our mountain bikes early this winter morning. Within an hour the Spanish sun has burnt off the mist and we’re cruising along a wide sandy trail. This camino real was once an ancient route for nomadic shepherds, but the only tracks I spy belong to a wild cat and, inexplicably, a set of bare human feet. Perhaps we’re following a hippie hiker or penitent pilgrim. Our trail climbs steeply to a plateau that looks across a desolate valley and into much of Navarre. With dust under our wheels and desert sun on our backs we already feel a world away from the lush valleys of the Pyrenees and the twisting alleyways of old Pamplona. I first came to the city in 1989 and developed an addiction to the place I wasn’t able to shake for 17 fiestas. But this normally sleepy city, an easy train ride from Barcelona, has a peacetime charm all its own. These days I return regularly to visit my teenage daughter Lucia, and to explore an even more fascinating side to this historic city when there isn’t a bull in sight. The Cabezo de Castildetierra rock formation punctuates Bardenas Reales with its fairytale-like spire. Peering from an arrow slit in the battlements that protected the Portal de Francia (Gateway to France), it’s easy to imagine the awe early pilgrims must have felt as they approached these rearing walls from the wild passes of the Pyrenees. Javier is not only an expert in Pamplona’s secret corners, but also in Ernest Hemingway’s celebrated love affair with Spain. So much so, he recently published a book on the subject called Eating with Hemingway. In The Sun Also Rises (the book that established Pamplona’s fiesta as the “hell-raising capital of the world”), Hemingway wrote of the empty plains that, at that time, still stretched from the foot of the city’s walls, and the twinkling lights on what he described as “the fort”. These days the abandoned fort is almost unknown, even among locals, and the pot-holed road that winds up the mountainside to it seems like a fast track to wild Spain. My guide, Stephanie Mutsaerts, eases our car to a halt to let a flock of sheep cascade around us in a fluffy white avalanche. Stephanie left her home in Canada 20 years ago and, after cultivating her Spanish in Barcelona, found outdoor adventure calling her to Navarre. Now abandoned for decades, Fort Alfonso XII was built on the hill in 1878 following a series of civil wars. It served as a notorious prison until 1945. The action is frozen in bronze. Ángel grew up at the foot of the hill and still walks or cycles up here most weekends. He’s the perfect guide, leading us through secret passageways to forgotten dungeons and old gun emplacements. Skulking through dark rooms that once housed hundreds of revolutionaries and thousands of political prisoners gives me the spooks, so I’m grateful when we emerge into the sunlight to gaze down on the walls of Pamplona and the 450-year-old star-shaped citadel that’s considered one of the best-preserved medieval fortifications in Europe. Only in a city with as much historical wealth as Pamplona could the massive granite fortifications remain almost unnoticed up on this mount. Forty minutes’ drive north-west of Pamplona you find the Bidasoa Valley, an area that is culturally Basque. And in towns such as Lesaka, you’ll rarely hear Spanish spoken in the streets. Lucia and I drive over to meet my friend Juan Carlos Pikabea, who comes from a Basque-speaking Lesaka family that can trace its roots back 500 years. The son of a timber merchant, Juan Carlos is now one of Navarre’s most celebrated artists and a man whose enthusiasm for local traditions seems almost limitless. Pigeon hunters use horns to give commands. There can be few towns even in Spain where history is as spectacularly concentrated as in Lesaka. As we walk the streets Juan Carlos points out mansions, watchtowers and armouries that date back a thousand years or more. Without his guidance I’d never have noticed the demonic faces peering out from the corners of some of the houses, sculpted as guardians against the evil eye. Near the church he points out a torture post where criminals and those accused of witchcraft were once hung up, with spikes driven through their tongues. Lucia is horrified to hear that children who stole fruit from the orchards were slathered in honey and bound to the post, where they were left to be tormented by the sticky feet of thousands of flies and ants. These days life in Bidasoa Valley is more peaceful, and people enjoy a quiet, rural existence that is closely linked to the changing seasons. The foothills of the Pyrenees seem to bleed colour in autumn, when the immense Irati Forest – Europe’s best-preserved beech and fir forest – explodes with flame-coloured foliage. Lesaka lies just 20 minutes from the Basque coast and enjoys a mild climate that makes these forested valleys particularly rich. Even today the people of these villages seem to have remained inveterate hunter-gatherers. Juan Carlos’s wife and daughters were out at dawn in a secret glade searching for setas, the wild mushrooms that are a local delicacy. It is only when we gather at the family table to sample the harvest with fresh-baked bread and robust Navarran wine that I realise why so many locals are dedicated to mushroom hunting. Far up on the mountaintop above Lesaka a group of ‘fishermen’ also gather each day before dawn to spread their nets in a province that has no sea. They hoist their giant webs between a channel of soaring trees to catch the migrating pigeons that will end up in the asadores, or rotisserie restaurants, across the region – often served with chocolate sauce. The first-known record of la palomera (the pigeoning) tradition was 640 years ago, when the people of the mountain town of Etxalar complained to the Catholic Church about a local priest who was holding morning mass at 4am so he could go pigeon hunting by daybreak. Since then, the pigeon-netters of Etxalar have honed their skills into a science. During October and November, flocks of up to 100,000 migrating pigeons pass daily through trees that form a narrow corridor where France meets Spain. When the birds get close, hunters in watchtowers lob wooden decoys (whitewashed ping-pong bats work a treat); thinking the flashes of white are hawks on the prowl the pigeons dive, aiming for the safety of the trees. Their evasive flight directs them straight into the waiting nets. One of the chaps blows on a brass horn to signal to the other hunters that they can now open fire with their shotguns, snuffing out the unfortunate birds. Visit Navarre in autumn, when the forests transform in a blaze of colour. Playing our part to support local tradition Lucia, Stephanie, local guide Alfonso Bermejo and I head to a typical mountain asador to dine on roasted pigeon. One of Spain’s great underrated traditions, sobremesa (over the table) means to extend a meal through the pleasures of coffee and liquor and, most importantly, conversation. It does seem strange the only tourists who visit Navarre come for either San Fermín, which was promoted initially by an American writer, or for the Camino de Santiago – of which only five or six days are spent in the province. Yet this tiny region is slowly becoming known as a modern-day place of pilgrimage for tourists who want to sample the real Spain. The word is finally out on what the world’s hell-raising capital does in its downtime. Fly Emirates from Sydney to Barcelona for AU$1410 return. From there you can jet to Pamplona, but the journey via train is far more comfortable, scenic and eco-friendly. The four-hour ride starts at AU$80 with Rail Plus or, if you’re venturing there on a wider Euro trip, travel with a Eurail Pass, which lets you cross the continent at your own pace. Keep an eye out for discounts of 20 per cent in November and free travel days released in February. Stephanie Mutsaerts’s company, Heart of Pamplona, offers incredible apartments in the city’s old town starting at AU$175 a night. Northern Spain Travel runs everything from cycling trips of Bardenas Reales to trekking the magical forest of Irati and exploring little-known highland villages.